Octopus 5mmLED light Brick, and special sensors Arduino board and ambient light sensor extension combination, can be used in the interaction with the light works. When the LED light module connected to Arduino, the digital pin (LOW on, HIGH off) is used to control it. The brightness of LED can be controlled via PWM output. Octopus Electronic Bricks, you can use them build electronics projects just as easy as piling bricks. 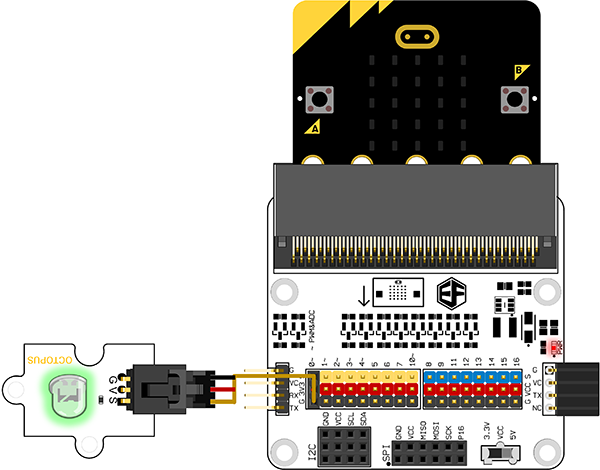 By using Octopus electronic bricks, you may connect Arduino/Freaduino compatible boards easily with various digital, analog and I2C/Uart interfaces. These the breadboard-less firm connection are prepared to extensive modules like poteniometers, sensors, relays, servos even buttons, just plug and play. The Freaduino Sensor Shield is the perfect shield to connect this senor to Arduino. Or Freaduino UNO which we had pre-stray Octopus Brick interface. There are five colors for you choosing. White(default), Red, Blue, Green, Yellow. Connect LED brick to P0 port on OCTOPUS:BIT. Or you can download it from the page below. LED brick falshes with 1 second interval.